More San Juan Island adventures! 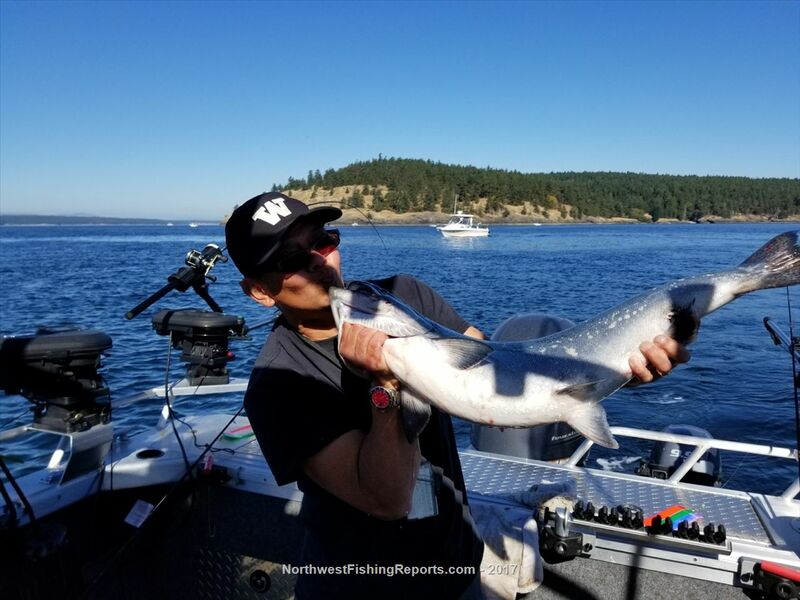 After Tuesday’s Atlantic Salmon trip to Cypress Island rseas suggested that on Friday we try for some Chinook Salmon on the west side of San Juan Island. He had a plan. When Randy has a plan I’ve learned to follow it because it generally includes good fishing. I was not disappointed. Robbie and I met Randy at 6am at the Cornet Bay launch and we loaded our gear, then headed out on a long run to the west side of San Juan Island. We ran in into some chop which Randy’s new Thunder Jet handled without missing a step. 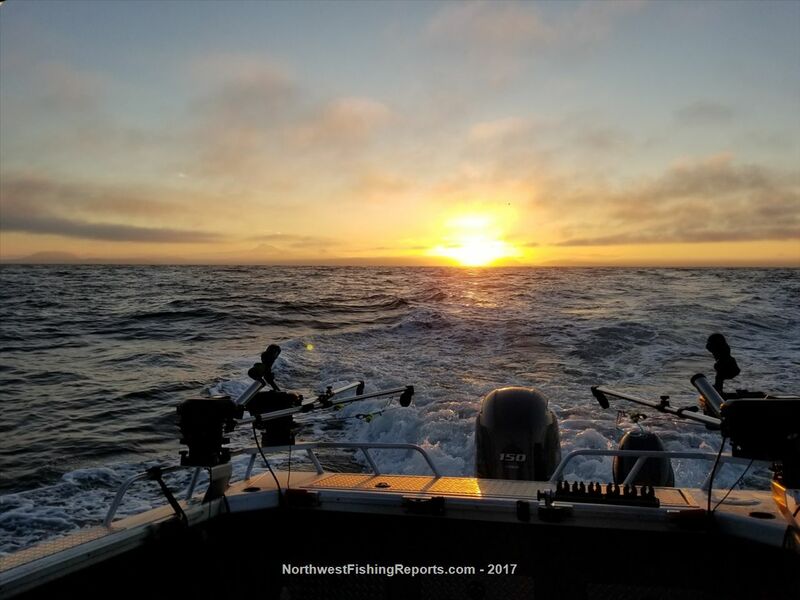 By the time we reached our first fishing location the seas had flattened out and it was going to be one of those beautiful late summer days on the water. Our first stop was Pile Point. Randy noted that we would have a short window to fish this spot due to the tides but it could produce well for big chinook if we hit it right. Today we ran three rods as Randy has four downriggers on his boat. We used large fishers and 48 inch leaders to 4” salmon spoons on two rods and a fly and herring strip on the third. The fishing in this area was for suspended chinook so lines were adjusted based on fish marks, not bottom tracking. Within minutes of starting the port rod released from its clip at 60 feet of depth. Robbie grabbed the rod and was into a nice chinook which unfortunately came unbuttoned. Even so, it was an encouraging start to the morning. The fish hit the fly/herring strip combo. We re-rigged and dropped the gear down. A few minutes later the inside port rod popped and I grabbed the rod. This time the fish was well stuck and line went screaming off my reel. It was a real pig of a fish! I slowly regained the line and worked the fish back to the boat as Randy skillfully netted a gorgeous 15 pound chinook. First fish in the boat and two fish on, plus another release that didn’t stick – it was a darn good start. I joked with Randy as he had warned us we could be doing a lot of trolling for 1-2 nice fish. By this time it was time to move off this location to our next spot, Henry Island/Open Bay. When we arrived Randy was surprised to find more boats than he expected. It wasn’t bad, maybe 8-9 boats. The gear went down and we started working the Bay doing wide circles. It didn’t take too long and the port rod again popped off with line screaming off the reel. Robbie grabbed the rod and was into the fish of the day. The big chinook tore line off the reel and was way back behind our boat as Robbie slowly regained line. Randy worked the boat in a turn to help gain line back, which helped as Robbie strained and began to have arm fatigue from battling the fish. The fish made a run toward the boat and Robbie announced "oh no, I lost the fish". Randy and I yelled to "keep reeling!" as we could see the fish was not off. As Robbie resumed he called out, relieved, "it's still on!" 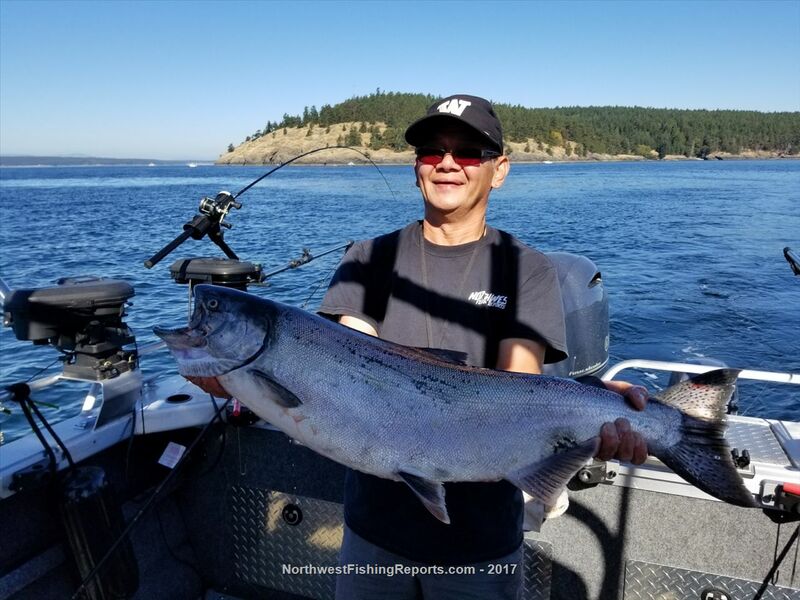 Soon the fish came to the side of the boat and we could see how big the fish was - a very nice chinook that Randy netted and pulled into the boat, measuring 17 pounds - but we're thinking his scale was off, because he sure looked like a twenty plus. In any case, two down and one to go. We set lines and went to work getting Randy's fish. 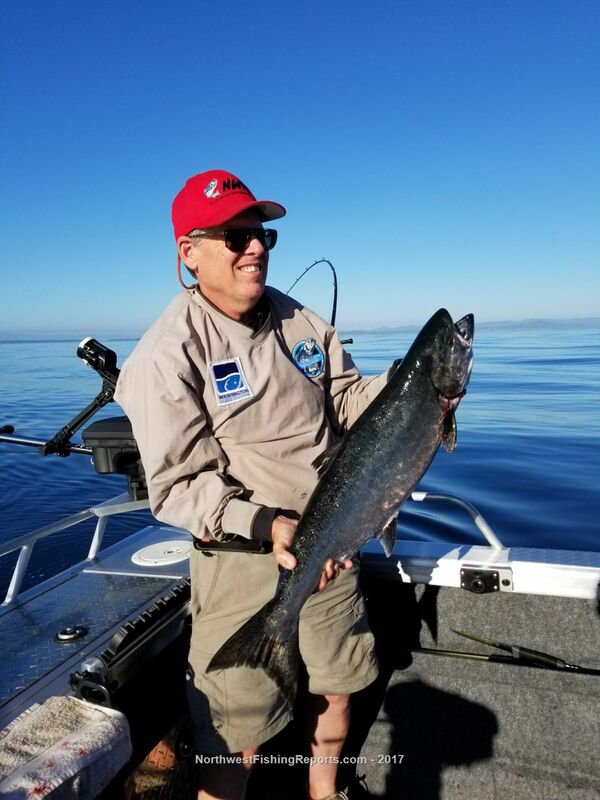 The action continued as Randy pulled in a 22" chinook that we released at boat side, then a nice fish that turned out to be a coho. All fish were suspended between 40 and 70 feet deep and Randy chased meter marks to induce strikes. Finally, Randy reset a rod and lowered it to 70 feet. As he was tightening the line down the rod started bouncing and it was "Fish On". 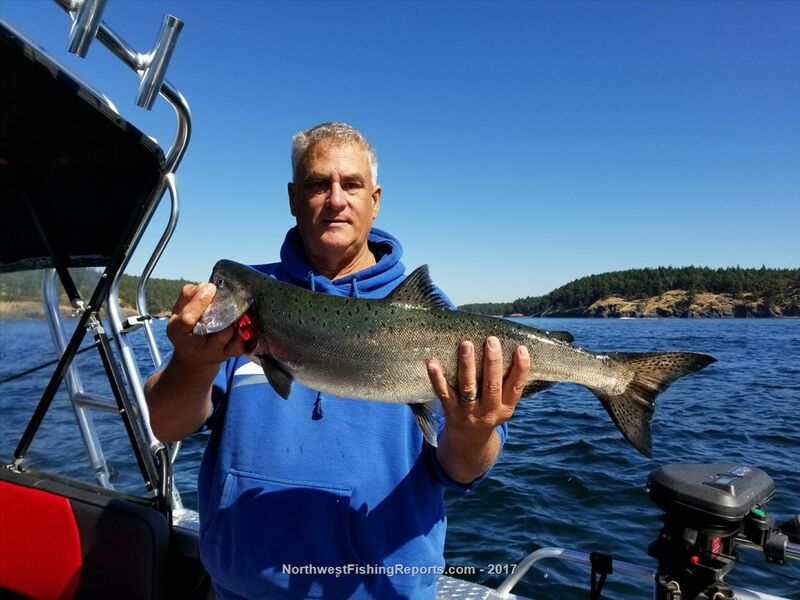 This chinook had a few nice runs in him and Randy skillfully played him to the boat where Robbie put the net to him, a respectable 8-9 pound fish. 11:40AM and our chinook limits were in the boat. We decided to return home via the inner passge through the Islands for a little sight seeing tour. We also stopped by Guemes and Cypress Island to see if we could get a few Atlantic Salmon, but despite some nice fish marks we had no luck and saw no fish jumping. We're guessing the jumping action is a morning thing. What a great day on the water fishing new locations! Thanks so much to rseas for sharing the day and his boat with us. It was an Epic Day of fishing I'm not to forget! I agree, that is a BIG 17 lbs. Hey Mike, Nice report and nice fish. There is just one thing you should know, you can only fish for the Atlantic salmon up until you have your limit Chinook, not after a limit. You are lucky you didn't get boarded by WDFW officers while fishing for Atlantic salmon. They were good. Daily limit is 2 salmon but only 1 chinook. As noted, limit is 2 salmon daily, one Chinook, and can also have one sockeye or pink. We stopped at one Chinook each so we each had another allowed salmon to fish for. We were out there Friday looking for atlantics. Circled all the way around Cypress even by the net pens and along the westside of Guemes where they were the week before and didnt see a single atlantic surface. I think the nets got most of them. I liked them, smoother than the files and they have an insert that fits the rod thumb rest, nice detail. love the reports mike. nice fish. hope to fish as much as you one day soon. Thank you, it's been a fun season. Your time will come!